PHOENIX — Due to a stalemate at the Capitol over changes in income tax laws, the head of the Senate Finance Committee wants to give Arizonans more time to file their 2018 returns. The proposal by Sen. J.D. Mesnard, R-Chandler, would spell out that this year — and this year only — state tax returns need not be filed until June 15. That’s two months later than the deadline set in state law. He said the ultimate outcome of the battle between legislative Republicans and Gov. Doug Ducey over those deductions — and whether tax rates should be lowered to offset additional revenue collections — likely won’t be determined before a state budget for the coming fiscal year is adopted. At the current pace of talks, that will come after the current tax-filing deadline, Mesnard said. That’s why he wants the delay for taxpayers. “People can still file earlier if they so choose,” using the tax forms already distributed by the state Department of Revenue, he said. Those are the only forms that will be available ahead of the current April 15 deadline unless there’s a legislative deal over income tax deductions and rates before then. What’s better, Mesnard said, is for taxpayers to be able to wait until the dispute is resolved and the political dust settles before filing their returns. Mesnard’s measure, Senate Bill 1481, is set for a hearing Wednesday. However, Ducey dismissed the idea of a delayed filing deadline out of hand. He told Capitol Media Services that people can use the forms already available — the ones that presume he gets his way. He would not consider any other questions about what happens if lawmakers won’t go along. Earlier this month, the Republican governor vetoed a plan approved by GOP lawmakers to delete the deductions, as Ducey wants, but also to cut tax rates to keep the overall tax burden on Arizonans from rising. All this surrounds the changes in federal tax law that took effect last year. Congress eliminated and curbed many deductions but offset that by doubling the standard deduction. 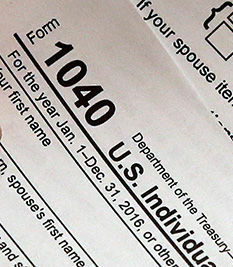 The result is that many federal taxpayers who had itemized no longer need to. Overall legislative budget analysts put the additional bite to individuals at a total of $190 million. But that is offset somewhat by changes to business taxes, also conforming to federal laws, that will save companies about $40 million. Ducey proposes to put any additional dollars collected into the state’s “rainy-day” fund. The bill the governor vetoed last week was designed to offset the additional state revenues with a 0.11 percentage point cut in tax rates across the board. Every Republican save Sen. Kate Brophy McGee of Phoenix voted for that plan; every Democrat voted against it. Would help charities seeing a decline in donations, but could cost state $30 million in tax revenue.